With the Direct Kitchens stunning range of furniture, we take care of providing you with the perfect working environment that aids motivation. Direct Kitchens of Sheffield can transform any room of your home into a stylish and productive home office with a complete and practical workstation tailored to you! Our expert designers will work with you to create a space that meets all your necessary requirements whether you work full time from home or need a dedicated space for when you get back from the office. Our wide selection of fitted home office furniture can integrate your desk and storage facilities using clever solutions that help you get the most out of the space available. Having a home office helps keeps people focused and allows them to clearly define the lines between their living area and working space, increasing productivity. Whatever your type of work, we’ll ensure your new office complements your style. At Direct Kitchens, professionalism, quality and customer service and satisfaction are our priorities. 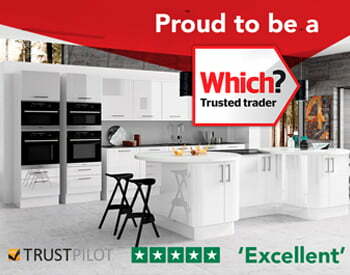 Our family-run business in Sheffield is proud to be a Which? Trusted Trader, so you can rest assured you will always receive the best quality and service from our dedicated team. We offer a free planning and design consultation and will visit your home to take measurements and get a feel for your style and needs. The consultation will last no longer than 30 minutes and once we have found out exactly what you need we will return to the showroom to design your new home office using our specialist 3D system. This gives you an idea of how your new project could look and gives you the opportunity to review, making sure everything is just as you want it before we go ahead with the installation. We provide a full project management service and will handle the entire process of installing your new home office furniture, including all building works and the removal of any walls, relaying floors, plastering and electronics. Plus, every office that we plan, design and install comes with a ten-year guarantee! To find out more about our stunning range, or to arrange a free consultation, give our Sheffield team a call on 0114 240 0158 or request a free quote here.